I’m not too into religion, but I have to say I’ve been a church shopper before. I am however, a Quaker. Weird, huh? A modern girl like myself. Either way, Quakers in West Philly have been doing something cool and a little be out of the ordinary. 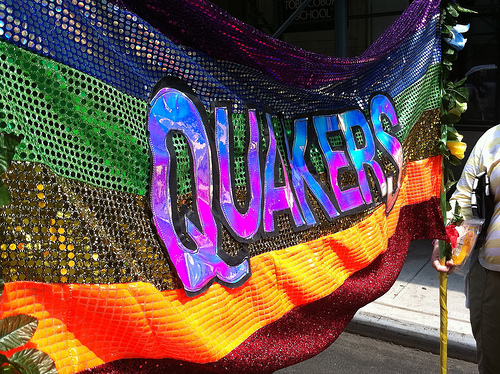 (Quakers in West Philly, who thought that was ordinary!?) They hold a small worship group on Wednesday at 7:30pm, typically in someone’s living room. Since it moves place to place each week, its good to check in with their list-serve. (Touch base here for more details: West Philly Google Group. About 10 min. for After thoughts (anything that didn’t rise to the level of a message. ), Joys/Concerns/Prayers, and Announcements. There is always a bit of socializing afterwards and if anyone has questions about Quakers or the Worship Group, there are always folks available to answer questions. Not sure what your spiritual inclination is? Take the Belief-o-Matic quiz to get a better perspective!